Looking for an attractive, functional, yet affordable outdoor storage shed for your yard or garden? Our sheds are built with attention to detail by the Pennsylvania Amish. No one has a better reputation for woodworking then the Amish. These skills have been passed down from generation to generation. Our custom sheds beat back the elements with top grade materials hand crafted to our high quality standards and your storage needs. Here at Champion Lawn we strive to bring you the highest quality shed at the most affordable price. We customize all our building styles through a full array of options to meet your personal tastes and needs. You won’t be disappointed. We guarantee it! Site Preparation Guidelines: Your new storage shed will require a level site. This may require some digging to eliminate grades or humps. We recommend allowing sufficient time to prepare the site prior to delivery. This will result in an attractive installation and less ongoing maintenance for you. After the site is leveled we suggest adding 3 to 4 inches of 2B gravel to the site. This is inexpensive and provides excellent drainage for your storage shed. Storage Shed Base: 2B gravel, 3 – 4 inches deep, and 1′ larger than the size of the storage shed. 2B gravel provides better drainage for rain or snow melt around the perimeter of the shed. Water that splashes directly onto the ground will eventually create a muddy area that will splash up onto the shed walls. To prepare a gravel base, remove the sod from an area slightly larger than the shed, level the site by removing dirt where necessary, and spread the gravel to a depth of about three inches. Tamp the gravel down with a piece of 4-by-4 or metal tamper until it is evenly distributed and the site is flat and level. Not Recommended: Cinder blocks. Inevitably, there will be some “settling” after your shed is delivered and placed on site. Placing a shed up on cinder blocks greatly increases the risk that you shed will settle unevenly. Site Access: Please be sure your site is accessible on the day of delivery. We ask that you provide a suitably prepared site and access to that site. Any trees and plantings must be removed. If you have a fence opening it must be 12′ wide for 10′ wide buildings and 14′ wide for 12′ wide buildings. For fences 8′ or higher, add 2′ extra. Our delivery equipment is 4-wheel drive and we are able to traverse most terrain without any problems. However, the weather and ground conditions do effect our delivery schedule. We appreciate your patience and cooperation when the weather in not cooperating with us. 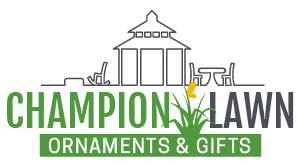 Permits: Regulations and requirements among different municipalities make it impossible for us at Champion Lawn to advise you on the exact requirements in your area. As the property owner, you are responsible for abiding by all municipal regulations in your particular area. We suggest that you find out all this information before ordering your storage shed. We will be happy to assist in any way we can by providing information concerning building specs and other aspects of construction that will ease the permitting process. Please call for current delivery fees.